After arriving by cruise ship into Port Chalmers, we boarded the city-run shuttles from the ship into the center of Dunedin. The shuttle cost $20 return per person (accepted in Australian dollars, New Zealand dollars, or American dollars – check currency exchange for what the best deal would be). The shuttle drops off right in the middle of Dunedin’s central Octagon. The shuttles run about every 5-10 minutes. You can also take the public bus into town. After disembarking the ship, head towards the town of Port Chalmers and find one of the bus stops on George Street. Bus route 14 heads into Dunedin and runs every 30 minutes. The fare is $6 each way if paying in cash. 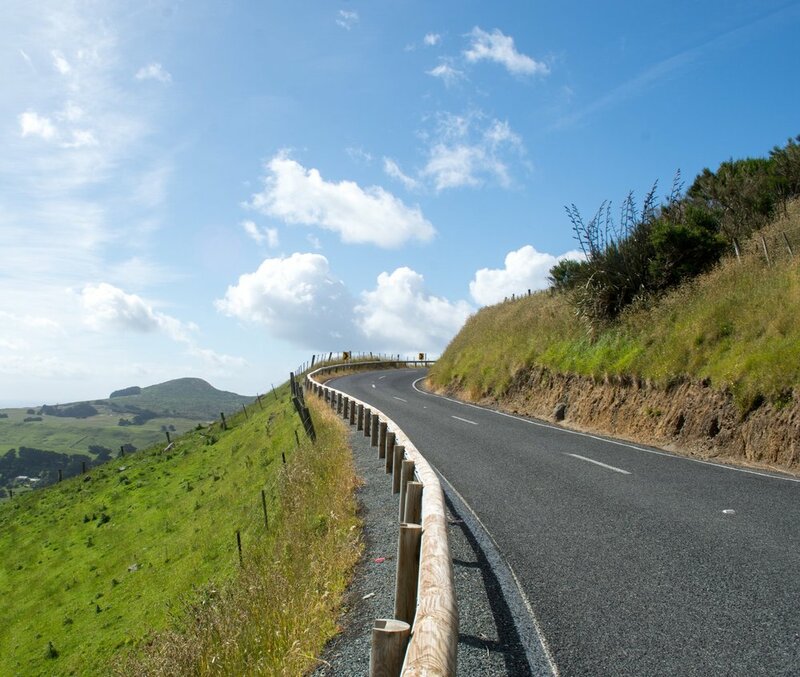 Note: There are a couple rental car companies that will deliver your rental car to Port Chalmers Typically, during the peak or holiday season, these companies stop offering pick-up from the port. It will cost a bit extra to pick up the car from the port, but you will save on avoiding the bus tickets. We rented from the Avis located just a block away from the Octagon. For our 7 hour rental, we were charged $71 nzd ($45 usd). Dunedin started as a Scottish settlement in 1848. Most of the buildings are still of Scottish design and the local population is still mostly of Scottish origin. Dunedin is also home to New Zealand’s first University. The Octagon is like the central square of Dunedin – but instead of a square, it is an 8-sided plaza with the two major thoroughfares crossing through it. The center of the Octagon hosts markets and street vendors. On the streets surrounding it are small shops and restaurants, and two large cathedrals. Prior to picking up the car, we visited the popular Dunedin Railway Station, a few minutes walk from the Octagon. The Dunedin Railway Station looks like an extremely elaborate gingerbread house with beautiful gardens out front. You are free to walk inside the station or just photograph it from the outside. It is often regarded as being one of the most photographed places in New Zealand. It is no longer being used for commuter trains, but scenic trains out to the Taieri Gorge still run daily. After visiting the Railway Station and heading back to the Octagon to pick up our rental car, we headed out to the Otago Peninsula. There are two main roads on the Otago Peninsula. Portobello Road is at sea level and hugs the coastline. Highcliff Road goes up and down the rolling hills of the Peninsula. Both roads offer incredible views, but Highcliff road is unbeatable. However, at points, it can be winding and quite narrow. Too narrow to fit two-way traffic at points. There are a few pull-offs along the road to stop and take pictures. Optional Addition: Larnach Castle. Otago Peninsula has a small Scottish-style castle, situated at the top of a hill and surrounded by gardens. It is New Zealand’s only castle. While it cannot fully compare to a European castle, it is a charming stop if you are willing to pay the entrance fee. Entry to the castle and grounds costs $35; it costs $17 for just the gardens. Just a short diversion off the main Highcliff Rd will take you to Sandfly Bay. This stop offers great coastal views and a chance to see some rare New Zealand wildlife. A short walk from the parking lot is an observation platform. If you want to go farther, there is a walk down to the beach that follows steep sand dunes that are tricky to navigate. This is made even harder by the strong winds. It is worth the hike if any wildlife is spotted down below. If you come at the right time, the beach is covered in sea lions, fur seals, and penguins. Continue along Highcliff Road until it turns onto Portobello, take a right and head along the sea toward the Royal Albatross Centre. The Royal Albatross Centre is home to the world’s only mainland Royal Albatross breeding colony. The centre sits at the very end of the Otago Peninsula. If you are really into birds, you can take one of the Centre’s Royal Albatross tours. For a free option, you can just walk around the area to get great views of the shore and the many, many seagulls. A few miles from Dunedin is Tunnel Beach – a beach tucked under gorgeous sandstone cliffs, only accessible by a man-made tunnel. The south shore of Dunedin has amazing wind-sculpted sandstone cliffs and rock formations. The hike down to the beach provides some of my favorite coastal views in the area. The trail down is steep. Very steep. It requires a reasonable level of fitness and probably won't be suitable if you have back or knee problems. You will also need good grippy shoes for both the walk down and up. We saw numerous people on our walk who were struggling with flip-flops. One even took off her shoes and was walking barefoot on the rocky path. It takes about 15 minutes to get down, but double that to get back up. The walkway down and tunnel were commissioned to be built by a local politician in the 1870s for his daughters to swim with privacy. The myth is that one of his daughters subsequently died from swimming off the beach. It was opened to the public in 1983 when it got a bit safer (i.e. steps in the tunnel). Swimming is permitted, but weather dependent. When we went, there are huge crashing waves that would terrify anyone out of getting in the water. During the peak season, you may find getting a parking spot a bit of a challenge. People frequently leave, so wait a few minutes and a spot should open up. In total, we spent a little over an hour hiking and exploring the beach. We then headed back into town to North Dunedin to walk up the steepest street in the world. Dunedin was a planned settlement for Scotland. After it was surveyed, city planners back in London laid out the streets in a visually pleasing grid-pattern with little attention to the terrain of the area. The region is very hilly and the end result of this obtuse planning are many steep streets throughout the city. Baldwin Street itself is at a 35% grade and all of the streets that run parallel to it have considerable inclines as well. It is not a street I’d recommend you drive up. Not only for the steepness but also because there will likely be many tourists walking up it. Park at a cross-street or on the section of street just before the incline and try your hand at walking it. It is difficult to understand just how steep it is until you start climbing it. After checking out Baldwin Street, we headed back into town and dropped off our rental car. If you are staying in town, Dunedin – being a college town – has plenty of nightlife. Having a ship to catch, we got back on the shuttle to Port Chalmers. What if I want to go on an organized tour? Then go for it! Due to its popularity, Dunedin has many tour companies ready to provide you either a private tour or as part of a group. Tours are a good option if are interested in the history of the area rather than just taking in the sights.